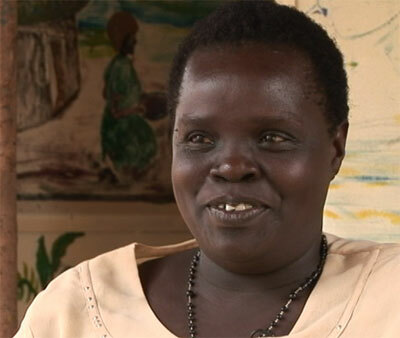 Grace Ayaa grew up in the rebel held north of Uganda. After fleeing the war in the late 1980s, she worked for the Red Cross and then for the micro-finance group, Life in Africa, helping others to start small businesses. She received a loan through Kiva earlier this year to improve her own peanut butter business. Here she talks about losing her husband in the war and her own journey out of poverty, and providing for her family as well as children left orphaned by the conflict. Q: Clark Boyd: How many people are you looking after now? A:Grace Ayaa: I have more than 12 people who are living in my house. Though I have others whom I'm supporting from outside. There are five children who are orphans. I have to look for ways of seeing that they go to school, which is so difficult. Here boarding school is the best. So whenever they reach the stage of going to a secondary school it really has to be a boarding school. There's no compromise about that. You take them to a day school, especially for the girls; at the end of the day they've done nothing. Q: How did you end up caring for these orphans? A:One was from my cousin's brother whose wife died. The wife was very sick in hospital, and she just told me, "There's no other person who is going to look after my child. My mother is blind." The next day, she dies. Her daughter was about 5 years old. And now she's 18 or 19. So she's a big girl. She ended up going to a tailoring school because at that point I had problems here and there. And the orphans, I took in one as I was coming back from the war zone. I saw both parents killed, so it was so sad and I couldn't really leave a child at that age, she was around 2 years old. You know when people run and people are killed, people are so scared. You run just anywhere and children are left behind. This was in Gulu. And I have two others whom I picked up in Kitgum. One, the father died. I don't even know exactly what the cause of the death was. But the mother was abducted. So, it's a real task. Q: Plus you have your own family as well. A:I do; a very large one. But then, fortunately I feel that it's all for the good and when we have to go without food, then we have the peanut butter. You know we can also make it into a sauce itself. Whenever there are potatoes or rice, if a staple food is there, or bananas, we add the peanut sauce with salty meat and they can eat and go to sleep. Q: I wanted to ask a little about when you fled from the north with your children. A:I was caught up in the fighting in 1986 when the real war started. So I trapped in the north until 1989. I left to come down to Gulu Town, because my husband's family were some 50 kilometers away. I had already started doing a little work with the Red Cross. And then in 1993, I came to Kampala with my family. I haven't been in one place here. In fact, I could no longer stay with the children down at the Acholi quarter [internally displaced persons camp in Kampala], so I had to shift them. They've grown. There's a lot of immorality in that place. In this kind of life, everyone is poor, the children always look at the few men who would come out to do some work to get little money. Most of the children in my house are girls. So it's really so difficult to control them. I have seen many girls at the quarters at the age of 13 and 14 getting pregnant. Very disgusting. So I decided it's not really a good place for the children to stay in. So I've moved. Not very far, but at least away from that. Q: What happened to your husband? A:He was abducted. The few people who knew him and were with him, and who managed to come back, say they saw him being killed. And that was it. The most painful part of it was I had to suffer with the children, because people around would think my husband was a rebel. They would say, "She shouldn't be part of us. She will bring us problems." So wherever I would go, people would have to run away because maybe the government would come and look for me, thinking I'm the wife of a rebel. So it was very difficult. I didn't want to give people problems so I would go and sleep in the bush by myself with the children, without anything to cover them. So that is what really prompted me to leave home and find a way of getting south. It was also very risky, because on my way, I had my head knocked by the end of the bayonet and I bled fairly well because I was pregnant and bleeding during pregnancy is really very bad. And so immediately I came, I was taken to a hospital in Gulu. I had at least two or three days there so that they checked that there wasn't anything wrong in the brain. But all in all, I survived that and reached town well with the children. Q: Tell us a little bit about the work you were doing in the Acholi Quarter in Kampala for Life in Africa, getting loan money out to people, and the difference that you think it's making in people's lives there. A:I'm really very grateful that this loan idea came up. People in the quarter don't have anything they can put up for security first of all. There isn't any way they can get money from the bank, because they don't have any belongings. But for Kiva, I'm really so happy that they have brought this device that people can get money without any proper security they have to present. So I'm happy that even with nothing, people managed to get their loans and right now what I'm seeing, many people have built. They've got very good houses and in the Acholi Quarter people benefited from this. And the many who managed to get other loans, like for the barbershop, the water tap, the retail shops; they're doing very well. Their income has increased, which wasn't the case before. Many people are coming out from the stone quarry business, which is a hectic and so hard. Q: We visited the quarry and there are many people still working there, living hand to mouth. A:I wouldn't deny that. There are 3,500 people who are living in the quarters. It is terrible for the people working in the stone quarry, because somebody has to work for barely 1,500 shillings a day, or at most for 2,000 shillings a day. Q: Which is a dollar? A dollar and a half? A:Yeah. It's just almost one dollar like this for a whole day's work. So you have so many things to work for. You have school fees. You have rent. You have clothing. So many of the children end up not going to school because, of course, you can't pay the fees let alone feed your family. The 1,500 shillings cannot be enough even for food. What you do is you go in the morning without any breakfast. Should you get something for the stones, you come back at around 10 a.m., get a bit of breakfast or some porridge. Take that porridge and then stay and work until 5 to 6 p.m. That's when you would have raised more, maybe 1,000 shillings, which is going to be your food for that evening. Q: And the food for maybe 10 other people. A:Yeah. The children are there, and unfortunately, our people have the highest birth rate because in a family you can find eight or ten children, and there maybe five orphans you are to look after. So all these children are supposed to eat from that 1,500 shillings a day. Q: That means there are a lot of people still striving to get to a level where they could qualify for a loan. A:It is true. Everybody feels that, "Maybe if I have the loan I can start some other business, which will relieve me from this stone quarry where I'm only earning 1,500 shillings. I was so amazed yesterday when we held an information meeting on the loan program. People are very interested. And I'm sure our next loan program is going to be more than 50 people, because everybody wants to get a loan. You can get to that so long as you're a member of Life in Africa and you are trying to find a way of getting some income so that you can pay back your loan. Q: And you received a loan for you peanut butter business. How is that going? A:I needed the loan to buy a fridge. So I already have bought my fridge so I could produce as much as possible and pack the peanut butter I have made in the fridge as I wait to dispatch them to my customers. I managed to raise some money, which allowed me to get a small piece of land where I feel that my next Kiva loan is going to help me start a building for my family. I'm really so happy that the loan has been there, so that I can get everything in place. I also bought the packaging materials with that money. I bought more of the raw produce for my peanut butter. And this really increased my sales and I feel so happy about that. This interview between Clark Boyd and Grace Ayaa took place in Kampala in September 2006. It has been edited for clarity.